Pack a vacation prep kit. If you have ever been to the Destin Publix or Walmart on a weekend, you know those stores are jam-packed. To avoid the long lines, take everything you will need, at least for the first few days, in your vacation prep kit. Leading up to your vacation, set aside a laundry basket or large beach tote and start filling with basic necessities. Some examples of things to bring from home: laundry soap, toilet paper, garbage bags, bath soap, napkins, paper plates, salt & pepper, cooking spices, reusable last storage containers, chip clips, coffee, tea, sugar, & coffee filters. Some of these items are provided by rental companies, but if you are staying for one week and/or traveling with a larger group, extras are always needed. Keep a master list so you don’t forget anything from home. Thankfully, there are now apps that can help you with packing list reminders. You can also go old-school and create a reusable list which reminds you to pack the sunglasses, beach towels, sunscreen, chargers, etc. Pack a sharpie and sticky notes for leaving notes during the week. Plan breakfast & lunch for the first few days. Freeze lunch meat, cheese, and milk, then throw in a cooler just before you leave home. If your journey is more than 8 hours, I would recommend grabbing these items at a grocery store before you get into town. 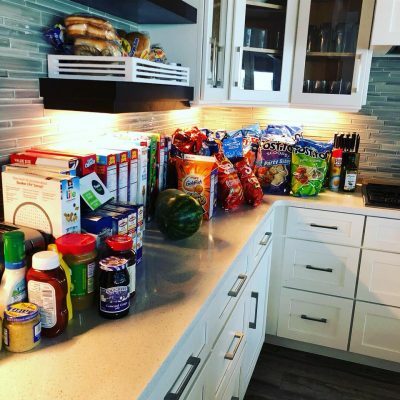 Add some boxes of cereal, bread, and snacks and you can get through the first few days without facing the long grocery store lines. Order your groceries. It’s well worth it to subscribe to Shipt, an app-based service grocery delivery service. Through the Shipt app, members create grocery lists, choose a one-hour delivery window, and pay for the order via credit card. A Shipt delivery person then picks up the order at your selected grocery store and delivers the groceries to the address submitted. If you are a subscriber in your hometown, you can switch your location to your vacation address. For a detailed map of the coverage area visit shipt.com/gulf-coast. Check out the current special of “two weeks free & $15 off your first order.” Shipt can also deliver from the ABC Fine Wines & Spirit store in Florida. Use local concierge services. Two local companies, Be My Shopper and Beach Butler, offer an even more personalized service. Shoppers will shop your grocery list and deliver to your rental unit, even putting away the groceries. It’s all there waiting for you on your arrival! Make dinner reservations. Schedule dinner either early or late. If you can avoid the 6:00-8:00 p.m. main dinner hour, this can help shorten your restaurant wait times. Several Destin restaurants are now accepting reservations through the OpenTable app.